Want to know what’s even better? It’s more energy efficient than just about every other heating method out there. 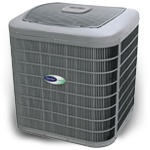 In fact, energy.gov estimates that a heat pump can save you as much as 30% to 40% on your heating costs. Plus, they’re ideal for moderate heating climates like Atlanta. Free money to help you pay for the upgrade – Local utility companies like Georgia Power, Greystone Power, Cobb EMC, Marietta Power and Carroll EMC are all encouraging homeowners to upgrade to heat pumps by offering incentives and rebates of up to $600. Need more information? Want to know if a heat pump could save you money? Get a free estimate from Ragsdale Air Conditioning and Heating.